One time cleaning services are available in DC, Maryland, and Virginia at affordable prices. Our well-experienced team of cleaning professionals is ready to make your home clean and safe place for you and your family. Maids Prime is here because you deserve the best, the most convenient, and the safest possible cleaning service to make your life easier. We know that you’re too busy and that your time and money are precious. 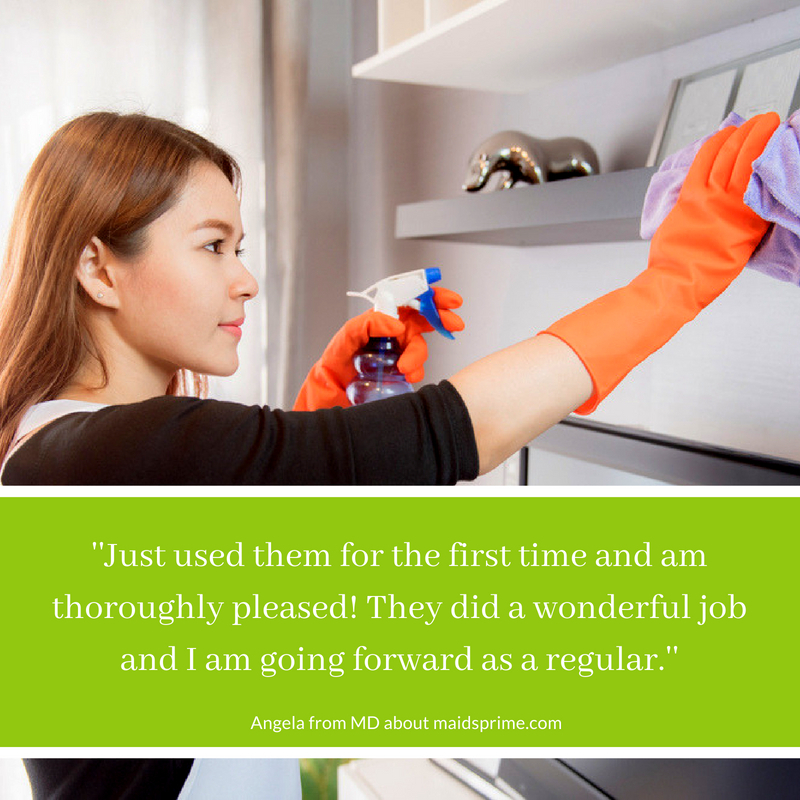 You can spare both your time and money and have a clean home, because Maids Prime is fast, accurate, and budget-friendly. Every home and client is unique. In order to respect this and meet your expectations, we create cleaning plans according to your schedule, budget, and requirements. Book cleaning services today with Maids Prime! Maids Prime is your ultimate choice if you need quality and competent one time cleaning services. Book our one time cleaning services today because we are adept, fast and reliable. Whether you’re our regular client or one time client, we’ll treat your home with great devotion and respect. No detail will stay unnoticed or uncovered. We will thoroughly clean your countertops, cabinets, backsplash, appliances, floors, a dishwasher, oven, refrigerator, stove, faucets, sinks, and more. Every little detail will be thoroughly cleaned and disinfected, set free from mold and rust. No spec of dust will be there after we leave! We will organize, mop, dust, and clean the most used room in your home. What other forget, we always make sparkling clean. Just tell us what do you want us to focus on and we’ll make it perfect! We can reach and clean all the hidden corners in your house, from huge areas such as floors and ceilings to all those small hidden corners in your drawers. We won’t miss a single part in your house. We guarantee that no detail will stay unseen or overlooked. When Do I Need One Time Cleaning Services? Our one time cleaning services are convenient to book if you need one time deep house cleaning or one time move in house cleaning services. We understand. One time cleaning services are a must in today’s busy world. Sometimes, life can be very active and hectic. Everyday activities draw most of your attention and time. Finally, when you and your family come back home, you feel tired from everyday challenges and wrestles. All you need is to take some rest and relax in order to recharge your batteries. On the other hand, your home is your oasis, and it’s vital to keep it clean and safe. It’s only natural you want to save your time and energy for your loved ones or any other enjoyable activities. One time cleaning services are an absolutely great choice and solution for your problems. Don’t let the cleaning take priority over the quality time you spend doing more relaxing and fun activities. Cleaning is our job and we can do it for you with full dedication. Maids Prime team of professionals is reliable, quick, thorough, and will take on your one time cleaning project with responsibility. 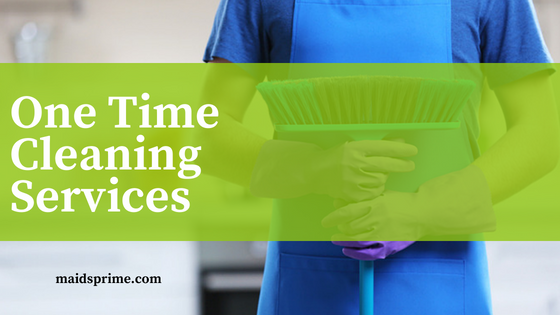 Maids Prime professional one time cleaning services are always there for you because sometimes you simply don’t have enough time or energy to clean your home. And there is no need. We can clean your home perfectly from top to toe. Contact Maids Prime and get top rated one time cleaning services in DC, Maryland, and Virginia. Maids Prime professionals always use eco-friendly chemicals in order to keep your home not only clean but safe as well. Also, we respect your home as our own and take care of your precious home including all the things in it. Choose us because our mission is to make you feel satisfied and relaxed. Maids Prime one time cleaning service is affordable. You can contact us today, ask for your free estimate, and see that we have lower prices than our competitors. However, you should consider some other facts as well. The often you book maid service, the less money it will cost. Although our one time cleaning service cost is budget friendly and all our prices for all cleaning types are affordable and reasonable, you will save money and get a cleaner house if you hire us more often. Weekly visits can save about $10 per visit on maid services. Sounds amazing, doesn’t it? In short, weekly visits are not only more cost-effective but also healthier. Regular cleaning of your home reduces bacteria, allergens, and all the other health concerning distractors. As you realize, there are numerous benefits of regular or routine cleaning schedule. One of them is that Maids Prime will always have the cleaning supplies your home needs. This means that you will actually save money because you don’t have to buy cleaning products. You can do that in case you require some special products due to your wishes and needs. You can book our once a week cleaning service, once every two weeks, and once every four weeks cleaning service. The most popular option is once every two weeks cleaning. One time cleaning is sometimes necessary. When you book one time cleaning services, you must be sure that the job will be well done. With Maids Prime, you don’t have to think – you simply know that we will leave your home sparkling clean. We provide one time cleaning services for both residential and commercial clients, for homes and offices alike. Whether you need one time cleaning services for your office or for your home, don’t hesitate to call Maids Prime. Your home is your oasis and your office is the place where you and your employees spend the most of the time. It is important to keep these spaces clean, healthy, and organized. In only one visit, our professional cleaners will do wonders for the cleanliness of your space. Don’t believe our word. Check us out yourself. Book cleaning services with Maids Prime today.